Squall is a very rare, mysterious person. While he has a strong, brave character, he usually doesn't shows it. He will carry any task or mission with defined goals and exactly as it was taken, but don't expect him to be very talkative during these events.Squall might seem like he's depressed or sad, but this is almost never the case, he's thoughtful and often over thinks a lot of the things that he sees or hears, but they aren't enough to make him depressed. - "Teradril" a Gunblade. [Level: 3+] +225 HP, +800 Strength, +200 Magic Defense. 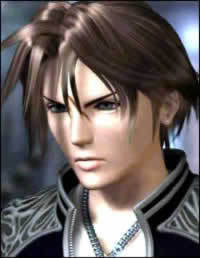 Description: Squall rushes towards the target, stopping right in front of him for a brief moment before leaping onto the air, once above his enemy, Squall 's speed and strength allows him to constantly slash his gunblade in every direction, hitting his enemy with its blade and firing shots at him as well. Description: Squall charges towards his opponent, stabbing his sword at a vital spot, the damage it initially does isn't a lot, but it leaves the opponent weakened. Additional Effects:[Debuff]. Causes Bleeding. For the next 3 turns, the enemy will take 50 Damage from bleeding. Description: After the encounter with Manifest Zero, Squall has become aware of the dangers there are in this world, this has opened a new mindset and willpower to sustain an incredible amount of damage and his body has evolved into sustaining itself even in the direst of situations. Additional Effects:[Passive Buff]. When Squall's HP has been depleted (dropped to less than 20%), his body realizes the dangers of the situation and releases extra adrenaline, thus increasing his strength by 25% for the next 3 turns. Usable once per battle. Description: Squall's gunblade has become sharper and fiercer than before, he rushes towards the opponent, leaping a few inches above it and starts a spinning motion, as he does, the gunblade shoots bullets all over the opponent while the blade slashes him as well. Description:[Debuff]Squall's strength and skill with his gunblade allows him to not only pierce through his opponent, but also to break the defensive capabilities they hold. As Squall attacks his opponent, the bullets and blade of his weapon break the enemies defenses. Additional Effects: Removes a defensive buff (Reflect, Protect, Shell, CA's abilities that shroud the enemy with a defensive barrier, etc). [Only one per use] If the enemy is not under the effect of any of those spells, reduce Defense by 10%. Description[Passive,Buff]: Squall has gone through the first evolution of his race, after getting the effects of this and realizing what burden lays in his shoulders, his will has become powerful enough to keep him going through the most difficult of moments. Additional Effects:When Squall's HP is dropped to less than 35%, his sheer will makes his body recover itself for a period of time. For the next 5 turns, his HP recovers at a rate of 5% of his max HP per action taken. As a trade off, it drains 5% of his MP per action taken. Description: Having mastered the strength and power of his own moves, Squall is able to create a hurricane that entraps the enemy, within the insides of this hurricane, Squall's gunblade slashes and shots the enemy for the entire duration. Description:[Passive,Buff]Through fights, information, missions and knowledge of the current state of Gaia, Squall has realized he cannot run from his destiny and his body has obtained that mentality as well, allowing him to fight through the toughest of situations. Additional Effects: When Squall's HP reaches 0, he can keep fighting for the next 5 turns, after this is done, regardless of any healing effects his HP will deplete and knock him out. If revived by any means, his MP will be 0 and his stats will all be halved. If Squall's HP reaches double negative ie) - his max hp. The effect ends and his stats are halved for another 3 threads pending revival. Description:[Passive,Buff]Squall's power has reached a point in which his attacks not only hurt his opponent's body, they reach into the very core of their being. The weapon Squall uses glows in an eerie green/red color as he rushes towards his opponent, slashing and shooting against them, the attack breaks the opponents will and body alike, removing any present buffs and preventing the use of new ones for 3 turns. Additional Effects:Removes every buff from the opponent and prevents new ones from being applied for 3 turns. Description: Among the warriors of Gaia Squall is most renowned for his fearsome physical strength. The Goetia crystal obtained during the Lunaria battle has began to stir, Squall's good actions seemingly influencing it, part of the crystal's power has now fused with Squall enhancing his already impressive raw power. Description: Squall's sword has become an artifact in which he puts his trust and his life, upon fighting with it, his weapon has developed to help its master by revitalizing his will to fight. Additional Effects: 3% of his damage is returned as HP & MP on Squall. - Protect: Reduces Physical Damage by half. Description Squall slashes his enemy more than once, adding his strength to each of his attacks and delivering a finishing blow. Additional Effects:Squall hits his enemy 5 times and finishes his limit with one of his own CA's(Ignores MP Requirements). His mana pool empties after using this limit. Description Squall channels his force through the gunblade, making it glow in a bright, incandescent color as he drags it across the battlefield, opening the ground and then slashing upwards onto the enemy for a powerful mix of elemental and physical damage. If it's by CA Level: 1 Level 3 CA x 500 Gil = 500 Gil used. If it's by CA Total: 8 CA's x 500 Gil = 4,000 Gil used. Description: Squall's power has reached a point in which his attacks not only hurt his opponent's body, they reach into the very core of their being. The weapon Squall uses glows in an eerie green/red color as he rushes towards his opponent, slashing and shooting against them, the attack breaks the opponents will and body alike, removing any present buffs and preventing the use of new ones for 3 turns. Additional Effects: Removes every buff from the opponent and prevents new ones from being applied for 3 turns.